Anyone that knows me, knows I’m a zombie freak. Any form of zombie media and I’m all over it. When I first heard about Zombieland I had mixed emotions about it. I’m more for the traditional slow moving zombie than the newer sprinters. 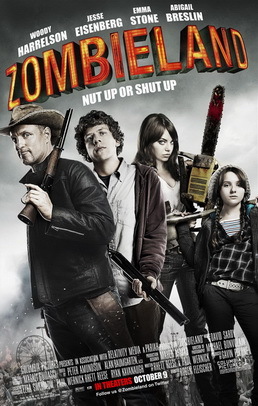 As the release date for Zombieland got closer I was more and more excited to see it. Does this movie hold up as a zombie film? Or is it buried in a shallow grave of regret and mistakes? Explosions and Sky Diving in new GTA4 DLC? Rockstar has released new screens today of their new DLC pack The Ballad of Gay Tony. Hit the jump for epic shots, including explosions, what looks like a riot, and an adrenaline junkie having fun. That’s right, new downloadable content for Mass Effect is up on the Xbox Live Market Place today. With Mass Effect 2 right around the corner will this be the content to link the two? Donuts bring super heroes together. Remember Comic Con? Yeah I know it was a while ago. Guess what just surfaced!? I saw G.I. Joe: The Rise of Cobra last night. Don’t cringe too hard, I’m fine. I think collectively we thought this movie was going to be horrible. You’d actually be surprised. That’s right. Boondock Saints 2: All Saint’s Day is finally coming out! How this one slipped under the radar I’m not certain. The trailer premiered at Comic Con recently, leaving fans in awe. Remember this movie? Of course you don’t, it’s not real. Back when Grindhouse was in theaters Robert Rodriguez made a fake trailer for the movie Machete. Later on he said he wanted to make it into a real movie and have it go right to DVD the same time Grindhouse came out, which didn’t happen. Where is this going? Kekeke Zerg Rush! So the release of Starcraft II: Wings of Liberty has been pushed back. This isn’t all bad news, it gives Activision Blizzard a chance to get things in working order. Sadly it’s not the pick I had in mind. I don’t think the technology to bring Bruce Lee back exists… yet. Instead we may see Kwon Sang-woo appearing alongside Seth Rogan’s Green Hornet as his martial artist side kick Kato. Yup, Dead Space is being turned into a movie. Seems everything is being turned into a movie one way or another. Games, books, board games, and television shows. Read more to see news on the production and other EA games being turned into movies. Yes this is the title of a real movie. The story of 4 guys who travel back in time accidentally with the aid of a Hot Tub. Sounds weird doesn’t it? Trailer after the jump, not safe for work due to language. Another Disney post today. This time it’s the Tron Legacy Lightcycle teaser video. When will Lightcycles become street legal? New trailer for Alice in Wonderland is on the tubes. If you didn’t know, Tim Burton is directing, with Johnny Depp as The Mad Hatter and Helena Bonham Carter as The Red Queen. The cast for this movie is huge. Hit the jump for the trailer. Seriously, what isn’t this guy in? He’s got to be just rolling in money and scripts. Wonder if he’s got a stack of scripts sitting on his coffee table from companies all over the place. So James Cameron’s mind explosion Avatar premiered 25 minutes of footage at Comic-Con. io9 has a great write up of the footage they saw. But there is more to this story than just a link to someone else having fun.